Dervish's latest album Irish Songbook is out now. Collaborators on the album include Steve Earle, David Gray and Rhiannon Giddens and this project encompasses everything from traditional dance music to love ballads, including a W.B. Yeats-penned serenade "Down by the Sally Gardens" and the classic "The Rocky Road to Dublin." The Great Irish Songbook is out now. 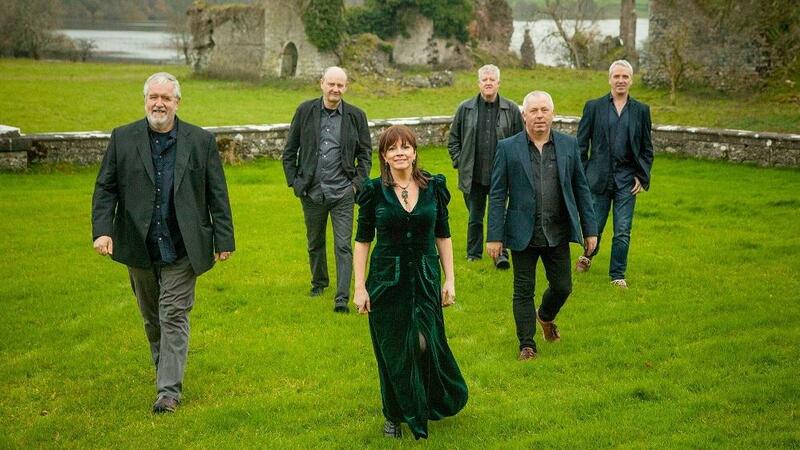 Founding Dervish member Shane Mitchell and longtime vocalist Cathy Jordan spoke with NPR's Scott Simon about the band's unlikely beginnings, the soul of Irish music and the making of The Great Irish Songbook. Hear the radio version of their conversation in the audio link and read on for interview highlights. Mitchell: We basically were a group of friends that were growing up together. We were asked to make a recording of local music one time and we had to come up with a title for the album pretty quickly. And we were just called The Boys of Sligo. Jordan: I wrecked it. [Laughs] They couldn't be The Boys of Sligo anymore! It was about '91 when when I joined. I was, at that time, making cakes and making pastries in County Longford and singing on the weekends. I had known the guys for quite some time and they decided that it was time to get a singer and I decided that I was fed up making cakes. I hitchhiked down to Sligo with my rucksack on my back and never came back. Jordan: The heartbreak, I guess, comes in many forms. It can come in immigration, leaving loved ones behind, of course, the affairs of the heart. We have far more songs about love unrequited than songs with happy endings, which I found [out] one time when I was asked to sing as somebody's wedding. They wanted a lovely traditional Irish ballad with a happy ending and I couldn't find one. There's usually somebody dead by the third verse and betrayed by the fourth or whatever. So, I'm not quite sure, there could be many reasons for it, but we have a few happy endings songs, you'll be delighted to know on The Great Irish Songbook. Mitchell: We continue to be surprised by how loved Irish music is. I suppose when we started this project nearly two years ago, the idea was to try and find people who had a love for Irish music from different genres of music. We found a lot of closet Irish folk music fans. In fact, we have enough to make three albums, somebody said at one stage. I am so proud of our music, that there's so much love and people get emotionally attached to us. It's a very positive genre of music and this was one of the reasons why we looked at this project. These are iconic songs that we all grew up with. You know, Irish pub music, people come together and it was a great sense of camaraderie when people would sing together. We just think that this was a great way to approach an album — breathe new life into these wonderful old songs. For nearly three decades, Dervish has put their own spin on Irish music. Now those musicians from County Sligo have a new album, "The Great Irish Songbook." And they've invited some famous friends to join them, including Vince Gill, Rhiannon Giddens, the Steeldrivers and Steve Earle. SIMON: Shane Mitchell is one of the founding members of Dervish and plays the accordion. He joins us from the studios of WBEZ in Chicago. Mr. Mitchell, thanks so much for being with us. SHANE MITCHELL: Thanks for having us, Scott. SIMON: Alongside him in the studio there is Dervish's longtime vocalist, Cathy Jordan. Thank you for being with us. CATHY JORDAN: You're welcome, Scott. Thanks for having us. SIMON: Shane Mitchell, let me begin with you. You guys used to be the Boys of Sligo, didn't you? MITCHELL: Yeah. That was a name on our first cassette, which it was at the time. We basically were a group of friends that were - grew up together. We were asked to make a recording of local music one time, and we had to come up with a title for the album pretty quickly. And we just called it "The Boys Of Sligo." JORDAN: I wrecked it (laughter). JORDAN: They couldn't be the Boys of Sligo anymore. JORDAN: (Singing) On a fine summer's morning, our horns they did blow. Yeah, that was about '91 when I joined. I was, at that time, making cakes, making pastries in County Longford and singing at the weekends. And I'd known the guys for quite some time. And they decided that it was time to get a singer, and I decided that I was fed up making cakes. And I hitchhiked down to Sligo with my rucksack on my back and never came back. SIMON: We're going to play one of your featured songs, "Donal Og." SIMON: Oh, sorry, "Donal Og." JORDAN: (Singing) Oh, Donal Og, when you cross the ocean, take me with you when you are going. At fair or market, you'll be well looked after. And you shall sleep with the Greek king's daughter. SIMON: A song that really tugs at your heartstrings, doesn't it, Cathy? JORDAN: ...Yeah. He was a scoundrel. JORDAN: (Singing) You said you'd meet me, but you were lying beside a sheep shed as the day was dying. SIMON: Why do the Irish excel at songs of heartbreak and betrayal? JORDAN: There's usually somebody dead by the third verse and betrayed by the fourth or whatever. So I'm not quite sure. There could be many reasons for it. But we have a few happy ending songs you'd be delighted to know on "The Great Irish Songbook." UNIDENTIFIED SINGERS: (Singing) Courting pretty women in the morning so early, mush-a ring dum-a do dum-a da. Whack for the daddy-o, whack for the daddy-o, there's whiskey in the jar. SIMON: As you tour around the world performing and sharing this music, are you sometimes surprised by how many spots around the globe Irish music is beloved? MITCHELL: For sure. We continue to be surprised by how loved Irish music is. And I suppose when we started this project nearly two years ago, the idea was to try and find people who had a love for Irish music from different genres of music. We found a lot of closet Irish folk music fans. In fact, we have enough to make three albums, I think somebody said at one stage. But it was amazing. It really was. I was so proud of our music - that it's so much love. People get emotionally attached to it. And it's a very positive genre of music. And this was one of the reasons why we looked at this project. These are iconic songs that we all grew up with, you know, Irish pub music. People'd come together, and it was a great sense of camaraderie when people would sing together. And we just think that, you know, this was a great way to approach an album, you know, breathe new life into these wonderful old songs. SIMON: Can we hear one more song? And I ask - I'm going to sob a little because my mother used to sing it to me. JORDAN: Which one is that? IMELDA MAY: (Singing) In Dublin's fair city, where the girls are so pretty, I first set my eyes on sweet Molly Malone as she wheeled her wheelbarrow through streets broad and narrow crying cockles and mussels, alive, alive, oh. SIMON: All right. You've got me. (Laughter) I'm sorry. But I bet a lot of people all over the world grew up hearing that song from their mothers. JORDAN: Absolutely. I mean, these songs - like, when I hear them, as well, I think of my mother and father and their struggles. And, you know, when I hear them now, I think of them by their own firesides singing them and passing them on. SIMON: You know what I always thought about "Molly Malone"? The story of Irish immigration in this country - United States - was not always happy. And the refrain, alive, alive, oh - I'm sorry - gets me every time. JORDAN: Yeah, she does such a beautiful job on it. And she really gets in under the skin of the song. And I know she was very emotional on the day singing it - for the memory of Molly Malone and all her ilk that struggled. SIMON: Shane Mitchell and Cathy Jordan from Dervish. Their new album, "The Great Irish Songbook." Thanks so much for being with us. MAY: (Singing) ...Crying cockles and mussels, alive, alive, oh... Transcript provided by NPR, Copyright NPR.